But if you have the right soundtrack, there’s nothing you need fear. Not howling winds nor driving snow. Not freezing rain nor icy path. Not the dark and lonely depths of night, where a man finds his very soul laid bare before his gods…and himself. Marc and Sharon Costanzo formed Len in Toronto in the early 90s as more of a musical project than a band, filling out the group with a revolving cast of friends and musicians.They gained some attention and momentum in underground circles, but spent most of the decade hitless and unknown. One fateful night in 1998, Marc and a few friends returned home from a long weekend of non-stop partying at a massive rave. They kept the fun train running and at one point the DJ spun “More, More, More” by The Andrea True Connection. Something clicked. The next day, Marc sampled and looped part of the track and wrote trippy, nonsensical lyrics about the previous night’s activities. He and Sharon then recorded a demo and threw it in the closet. Neither one thought much of the track’s potential, even when they managed to get it placed on the soundtrack to the 1999 movie Go. 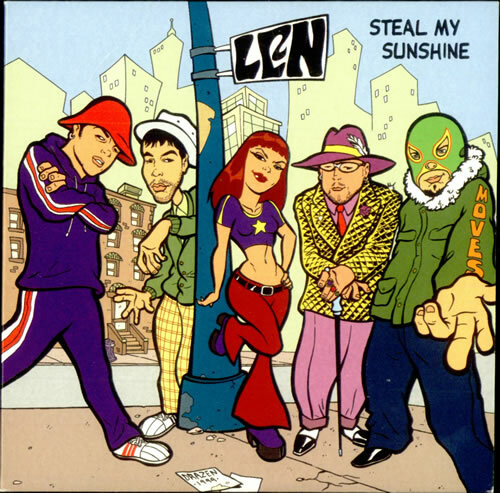 Unexpectedly, “Steal My Sunshine” started getting radio play. Marc and Sharon hadn’t planned on using the track on their upcoming album and had to dig out the master tape from under Marc’s bed. By the end of the summer, the single had gone Top 10 in the US. And, in true one-hit wonder fashion, Len was never heard from again. So press play and keep the cold at bay — if only for a few minutes — or you’ll miss a million miles of fun.